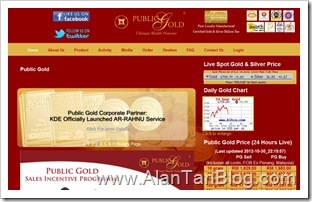 Public Gold name was removed from the Bank Negara Malaysia’s (BNM) consumer alert list on 29 October 2012. Bank Negara Malaysia | Central Bank of Malaysia WARNING on Public Gold! “The de-listing is NOT an Endorsement or Authorisation by BNM on the company’s business activities. BNM will continue to monitor entities to ensure no illegal activities are conducted,” a Bank Negara official told theedgemalaysia. Datuk Louis Ng, founder and executive chairman of Public Gold, say that Public Gold practice a transparent business model whereby they solely buy and sell physical gold and silver bars without deceiving our customers with unrealistic offers. Good news to all the Public Gold’s consultant and investors. Some of the extract of the gold trading company statement. “At Public Gold, we practice a transparent business model whereby we solely buy and sell physical gold and silver bars without deceiving our customers with unrealistic offers,” Datuk Louis Ng, founder and executive chairman of Public Gold, said in the statement. Public Gold, which has 18 branches and is NOT related to Public Bank Bhd, said it will “continue to maintain a proactive relationship with BNM and local authorities to comply with guidelines at all times”. This entry was posted on Wednesday, October 31st, 2012 at 7:40 am	and is filed under Investment. You can follow any responses to this entry through the RSS 2.0 feed. Both comments and pings are currently closed.